Rebecca Lange - Norwex Independent Sales Consultant: Capitalize on the Norwex Potential! Are you motivated? Do you feel passionate about the environment? Will you share your knowledge with others to help them live cleaner, healthier lives? Would you like to earn extra income, on a flexible schedule, with a respectable and established company? 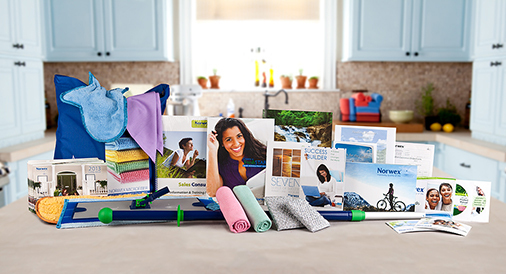 Below are the products you will receive for FREE* when you make the decision to join the Norwex team and become a Norwex Independent Sales Consultant. As a consultant, you'll be helping others to save time and money, create a better environment, and improve health. Cleaning with most Norwex products requires only water! Your customers will save money on paper towels, sponges, and toxic cleaners. You won't be exposed to touch or breath in the harmful chemicals. Dirt and dust are removed with Norwex cleaning supplies, rather than spread around. This creates a cleaner indoor environment and helps reduce allergies! Norwex is FLEXIBLE and FUN. As a Norwex Independent Sales Consultant, you'll have the option to sell one-on-one, at home parties, at trade shows, or through your online website and catalog shows. ...work a flexible schedule to allow you to maximize family time? ...utilize it as a creative outlet to showcase your talents, knowledge, and desire to help others? Through Norwex, we are creating a better environment for ourselves, our family, our children, our friends, and our Earth. Please email me or call me (336-202-3316) with questions. I'd be more than happy to discuss the Norwex options with you! *To receive the Starter Kit free, simply submit a minimum of $2000 in your first 90 days. If your sales are less than $2000 within your first 90 days you agree to be billed $200.00 plus applicable taxes.